In July, sailors from the Mystic River Mudheads, Niantic Bay Yacht Club, Stonington Dinghy Club and Thames Yacht Club raced in the 25th Annual Mudhead Benefit Cup and raised funds for the Center for Hospice Care. 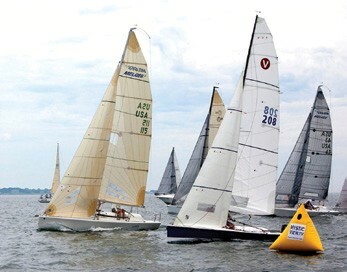 Participants ranged from junior racers to seasoned sailors from the Southeastern Connecticut community and beyond. More than 60 boats in nine classes competed on a beautiful day, with shifty winds in Fishers Island Sound. Results are posted at mudhead.org. In addition to the races, the Mystic River Mudheads held their annual Mega Party at the Mystic Shipyard to benefit the Center for Hospice Care. Thanks to the dedication of many volunteers, this event alone raised $37,000. Over 425 people attended and enjoyed great food from Mohegan Sun and musical entertainment from Rock N Soul Revue. These events, combined with the generosity of many sponsors including Dominion, Lawrence + Memorial Hospital and Backus Hospital, raised over $65,000 for the Center for Hospice Care. These funds make it possible for the Center for Hospice Care to provide bereavement services, free of charge, to any adult or child in New London County who needs them whether or not they have had a loved one on our program. In addition, funds are used to provide quality end-of-life care to anyone who needs it and meets the qualifications, even if they are uninsured or under-insured and unable to pay. The fundraising festivities aren’t done yet! On Friday, September 5, the Niantic Bay Yacht Club in Niantic, CT will host their annual fundraising party to benefit the Center for Hospice Care. To learn more and purchase tickets, visit hospiceregatta.kintera.org/nbyc14 or email events@hospicesect.org.